Referees: The Area 11L January Referee Training Conference will be January 27-29, 2017 at Laguna Hills High School 25401 Paseo de Valencia, Laguna Hills CA. We have a full range of referee classes, taught by some of the finest instructors in Southern California. If you know of new volunteers interested in refereeing, please direct them to the Regional Referee courses. If you have not already registered for class, click here to sign up. We hope you are excited about the start of the Fall season. Please review the information below. 1. ALL VOLUNTEER ORGANIZATION: Please remember that AYSO is an all-volunteer organization. It’s moms, dads, grandparents and siblings that keep this organization going. We ALWAYS need coaches, referees, board members and volunteers to perform other functions (like stripe soccer fields and set up/break down the fields). If you have not signed up as a volunteer, please contact your coach or any board member and we will help get you started. It’s a very rewarding experience, giving back to the Laguna Hills community. 2. GAMES: Games start September 10th. The Jamboree/U5 program does not have actual games. Our U6, U8 and U10 teams are playing games with Laguna Niguel so your games will be in either city. Our U12 and above teams will play against teams from most south county cities so you will travel a little more. Please be flexible with the schedule as games sometimes get moved around. 3. UK TRAINERS: We are once again working with the UK Soccer coaches on player and coach development. In addition to running our Jamboree program, the UK coaches will be training our players and coaches for 8 weeks of the season. Each team (U8 and above) will have the UK coaches for a session or two during the season. 4. LACE FOR A CURE: If you have played in Laguna Hills in the past 4 years, you are aware that we started a program to raise money for breast cancer. We encourage all players and parents to purchase pink shoe laces/hats/shirts/wrist bands and wear them proudly in the month of October. We will be selling these items at the LHCC fields on all Saturdays during October. We donated over $6,000 to the Susan Komen Foundation for last year’s sales! Please help support this worthwhile cause. 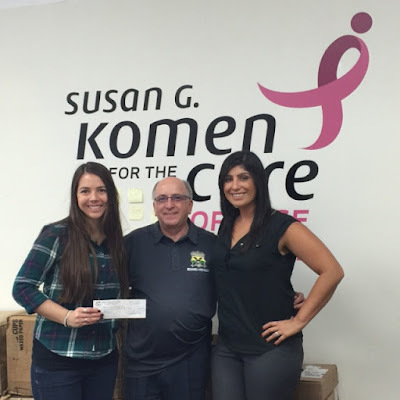 Laguna Hills AYSO donated over $6,000 to the Susan Komen Foundation. AYSO started an adult soccer league last fall. We are going to have it again this fall, although we are looking to make it a little less competitive than last fall (i.e. no slide tackling). We are hoping to have 75 minute games on Friday nights at the LHCC. It's a great way to learn more about soccer and stay in shape. Please contact Daniel Vallome (vallome@cox.net) if you are interested or have questions. Congratulations to Coach Van Dam’s U12 Boys team that won the Area and Section All Star tournaments! They then played in the Western States Tournament, beating a team from the San Francisco Bay Area to make it to the final game. They lost a hard fought battle to a team from Los Angeles in the Championship game. This is the best showing by a Laguna Hills team in the Western States Tournament! Please see the attached articles documenting their performance. Region 1422 is a “platinum award” winner for the first time in our 12 year history. This award (which is the highest award available) is for the Regional Assessment Program (RAP) and is given to regions that successfully implement AYSO programs and actively support the AYSO philosophies. Our Region had been a “gold award” winner the past few years. Thanks to all the volunteers who made this possible! Pictures from 2014 AYSO Section 11 VIP Tournament on October 19, 2014 Vista Hermosa Park AYSO Region 111 San Clemente, California. We would like to thank the following sponsors for their generous donations. We sincerely appreciate their support for the Lace For A Cure program! OC Register: Laguna Hills AYSO team wins area title Dec 17, 2013:Region 1422 crowned one champion, had two finalists, and one semifinalist in the Area Playoffs.